The Girls und Panzer Der Film soundtrack will include two disks, totalling thirty-eight tracks and will retail for 3780 yen (around 41.85 CAD), set for release on November 18, 2015. Releasing separately on November 25 will be ChouCho’s performance of the movie’s main theme, titled “piece of youth” (and will include the inset song “GloryStory”). The soundtrack’s tracklist appears to consist of some reprises of the songs seen in the original soundtrack for the Girls und Panzer anime, but a fair number of them also appear to be new pieces composed specifically for the movie itself. 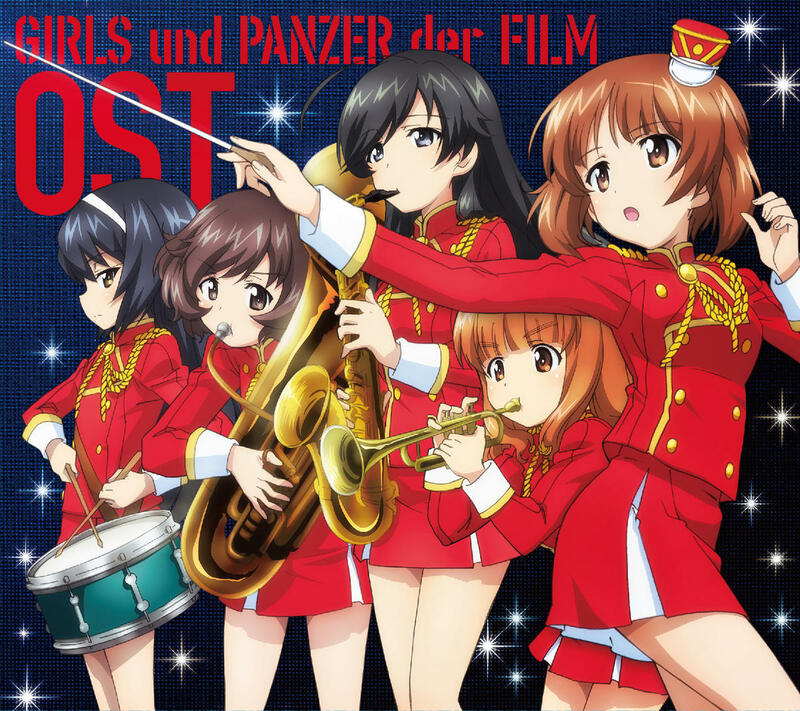 Because music is primarily used to establish or accentuate a particular mood for a scene, the tracks themselves are often named such that listeners can readily identify the scene a track is intended to accompany, and consequently, the remainder of this entire post, which prima facie appears as an innocuous talk about the Girls und Panzer Der Film soundtrack’s music, suddenly becomes a spoiler-laden minefield. I anticipate that a home release for Girls und Panzer Der Film will be six months following the premier, so those outside of Japan will have an opportunity to watch the film by around May 2016. Variations means that the earliest the film will come out is March 2016 (as did the Gundam 00: Awakening of the Trailblazer movie, where the home release came out three months after the initial release), and the latest would be September 2016 (similar to The Disappearance of Suzumiya Haruhi, where the home release came out ten months after the initial release). Whereas Girls und Panzer Der Film‘s soundtrack had a release date that had been known as early as August 2015, there is surprise in that said soundtrack will retail a full three days before the movie itself is set to premier. In several past occasions, such as with Captain America and Star Wars Episode I: The Phantom Menace, the tracklist gave away core elements within their respective films, and consequently, in spite of all the secrecy surrounding Girls und Panzer Der Film, it is decidedly unusual that the soundtrack will be available before the film itself. As per my modus operandi, I’ve provided the tracklist here, along with a crudely-wrought English translation of the titles: there are 32 songs on the first CD, and with the movie being an estimated 120 minutes long, I imagine that the tracks will average around three minutes in length. It’s worth mentioning again that there might be some spoiler elements below. The expectations for Girls und Panzer Der Film are off the charts: the movie was originally intended to be 90 minutes long and to be released last year, but the directors decided that an additional half-hour was needed to adequately convey all of the thematic elements. The cycle of delay in Girls und Panzer is not new: the Anzio OVA was originally set for a summer 2013 release and was pushed back to Summer 2014, and the original TV series was delayed by four months in airing its finale. The reason audiences forgive these delays is because each and every time, the additional time allowed director Tsutomu Mizushima to produce a superior product. While I do not feel that it is reasonable to expect Girls und Panzer Der Film to match the quality seen in Lord of The Rings or Dark Knight, I am looking forwards to seeing what the film has to offer. I note that the translations I’ve provided are only approximations only and may not necessarily be correct. However, for the purposes of discussion, they should be satisfactory. Given that Actas and Tsutomu Mizushima have kept the film’s main plot under the same lock-and-key as the designs from the Manhattan Project, the decision to allow publication of Girls und Panzer Der Film‘s soundtrack tracklist implies that they are reasonably confident that the music and its naming will not disclose critical elements to the film’s plot. With that being said, little to no information has been released, even with the trailers that have recently begun circulating: audiences looking through the trailers only have remarked that the trailers have been surprisingly limited, only depicting some new characters and what appears to be a collaborative exercise between the different schools. The tracklist for the first CD suggests that there will be two major battles in Girls und Panzer Der Film: besides the aforementioned collaborative battle with Ooarai, St. Glorianna and Chi-ha Tan, there’s also going to be a major showdown with a hitherto-unidentified school. The naming of the tracks suggest that Ooarai will be on the defensive throughout the match against either a strategically or technically superior enemy: there will be a lull in the combat, and something will allow Miho to find what it takes to motivate Ooarai. The last track might be indicative of an Ooarai Victory. The second CD features unique music to the Finnish, American, German and Japanese armed forces. In addition, there appears to be another variation of “Yuki no Shingun”. All in all, I anticipate that the soundtrack will doubtlessly be a fantastic listen when it comes out. If you have access to Garupan other Music discs there’s another variation of Yuki no Shingun sung by Ankou team. Hopefully there’s a new version from the movies! I’d like to thank both of you for letting me know 🙂 It’s been bugging me for the past two years that I never successfully had a chance to listen to Yuki no Shingun, but I’ve got the chance to listen to both versions now. I’ve made the pertinent updates to this post such that other readers will obtain the correct information from here on out.